Great news! OG’s Speculative Fiction, Issue 20 has been released! In J.F. Peterson’s “Salt Ice” a good or bad choice is as thin and breakable as salt ice. Edward W. Robertson’s “Every Song is a Love Song” tells the story of man finding home on a faraway planet. Also included is poetry by Bruce Boston. Let us know what you think of the issue! 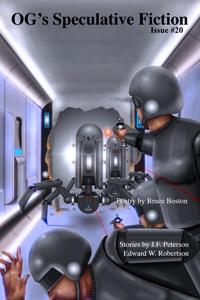 Don’t miss our other issues of OG’s Speculative Fiction if you haven’t read them.